*Okay, okay, I know what you’re thinking. “Exciting? You think our systemic issues aren’t exciting enough?” I don’t mean to sound blasé about our current situation. But the day-to-day dystopia of middle class America — advertisements nested within advertisements, phones that listen to your conversations so you’ll have a perfectly-timed video of the grill you were thinking of buying from A****n.com — is grossly conventional. 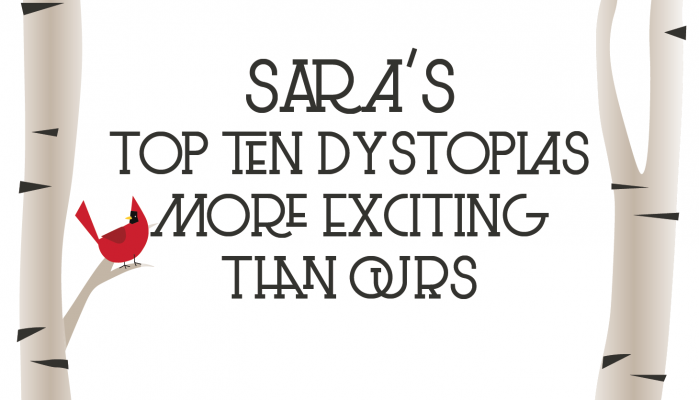 **So this isn’t to say that the dystopias in this book are vastly different from our reality — and honestly, not all of them are technically dystopias — but they do, in my mind, play with our reality in a way that I think is absolutely worth attention. In Tawada’s newest novel (now the first National Book Award Winner for Literature in Translation), Japan has cut itself off from the rest of the world. Xenophobia has affected everything: language, lifestyle, mortality... all are subtly different from the world we know. Tawada manages this uncanny imagined landscape with grace, a surprising amount of warmth, and a very delicate touch. I love Kim Hyesoon’s poetry. Her spectacular, grotesque book All the Garbage of the World, Unite was a favorite of mine in 2011, when it came out. In Autobiography of Death, Kim Hyesoon has compiled 49 poems, each of which represents a day a soul experiences on earth between death and reincarnation. Again, Hyesoon delves into the gross squall of bodily decomposition (in the first poem, the spirit watches as the body dies and has her personal belongings burgled), while also mourning the way society responds to major structural crises. A woman in Uruguay attempts suicide on the eve of her 30th birthday, but instead of dying she becomes hyper-aware of her surroundings — enlightened, even— and wanders the woods and village outside her apartment. The sight of her form throws the village into chaos, as they are forced to confront the rocky religious morality and misogyny their lives are based on. This small book is allegorical but still a page-turner. It was written in 1950! In Uruguay! Critics complained that it was impossible that a woman might be the author of such an explicit text. TOUGH. Get used to it. My favorite thing about these stories is that they’re all set in mundane every day places — homes, supermarkets, boutiques — and yet form a bridge between the familiar and the alien. These characters are tied together by a sense of longing or frustration that cannot be satisfied by their typical rigamarole. The Lonesome Bodybuilder’s vignettes will appeal to lovers of the surreal, but also to people who never stopped seeing magic in the everyday. Motoya allows the strange and mystical to become an often joyous part of life; without judgement, the abnormal and normal are able to merge. Revolution Sunday accesses a deeply troubled facet of Cuba’s struggles with censorship and surveillance. In the wake of the repeated jailing of artists such as Tania Bruguera, Wendy Guerra does a spectacular job of laying out the troubles and paranoias of living in Cuba as a radical artist. Main character Cloe’s day-to-day life includes disappearing documents, international fame versus local anonymity, and her family’s secret agent (who often comes over for meals). All of the paranoia that Yukiko Motoya renounced is here, in this book. An unnamed ex-detective comes out of retirement to venture deep into a strange forest an with eerie pull. Her intent is to find a man’s ex-wife, but once inside the forest her mission becomes splintered. This book is a freak show, a Little Red Riding Hood story, a fairy tale. It’s all wrapped up into a slim package that will immerse you and leave you desperately confused but thrilled. Mariko Ohara’s book was initially published in the 90’s, but didn’t make it to the US until this year, thanks to the translation of Jodie Beck. This one immediately made it into the “sci fi classics” category for me. When a cyborg escapes a lab, he eludes his hunters by shapeshifting (and he’s able to do so with any form he’s encountered and of which he's cataloged the DNA). He shapeshifts into a small girl, a plane, a plant… this book stretches the definition of “living organism” and is highly empathetic even throughout its grisly fight scenes. I would consider it a deeply feminist work, with as many ties to mythology and fairy tale as it has to the sci fi tradition. This little book accomplishes so much in 150 pages. The book ricochets from a failed, morally-dubious experiment in a 1907 asylum to the performance art scene in the early 2000s. If you’re looking for a wild ride, this might be your dream novel. Mixing lowbrow and highbrow, science and art, Comemadre has everything from frog figurines to talking heads to identical artists, all of which culminate in investigating the questions: do we have a soul? When does the body die? What is transcendence? 1920’s speculative fiction about trauma, agency, and MONTREAL. How cool is that? This book does an incredible job of giving the scope of a whole culture through the lens of a single individual. Elsie, the protagonist, is a fantastic, fully-realized personality who moves around Morrow’s created world with curiosity and thoughtfulness. Morrow’s book definitely made waves when it came out in hardcover, and it’s soon to be released in a gorgeous paperback version. See my interview with Bethany here! Tillie Walden always does a spectacular job with world-building. In her newest graphic novel, a girl crosses space and time to find her long-lost lover. The narrative is deeply moving, but the best thing about ON A SUNBEAM is how INCREDIBLE it is as a visual object. Walden uses rich colors to share emotion and atmosphere in frames where characters are fairly quiet. See my interview with Tillie here!